How Often Do Guinea Pigs Need to Be Washed? Guinea pigs clean themselves, so baths are rare. Certain ailments make a bath necessary; otherwise you might bathe a guinea pig if its long coat is particularly soiled or if you're showing the pet for conformation. Bathing a rodent can pose health risks. You must take extreme care to ensure he doesn't become chilled or stressed. Proper bath products are vital as well. Short-hair and long-hair guinea pigs have vastly different grooming needs. Most short-haired cavies are excellent self-groomers. A short-haired guinea pig whose cage is properly cleaned shouldn't ever need a bath. Long-haired pigs are another story. Breeds such as the Peruvian guinea pig have stunning tresses that can grow up to 20 inches long. These cavies need to be groomed every single day with a brush. They may also need a bath with shampoo and de-tangler every three to four months to prevent messy mats around their butts. Fancy long-hair or curly-hair pigs with fur less than 3 inches long do not usually need baths but should be brushed every few days. Guinea pigs do need to be washed if they catch a fungal or parasite infection. Guinea pigs can catch rodent lice and mange mites. They may also suffer from cat, dog and rodent fleas. You'll be able to see fleas, but most lice, mite and fungal infestations require a veterinary diagnosis. If your unfortunate pet has caught any of these pests, your vet will prescribe or recommend medicated shampoos and guide you through the bathing process. She may give your pig topical, oral or injected medication. Show cavies are usually bathed before each event. 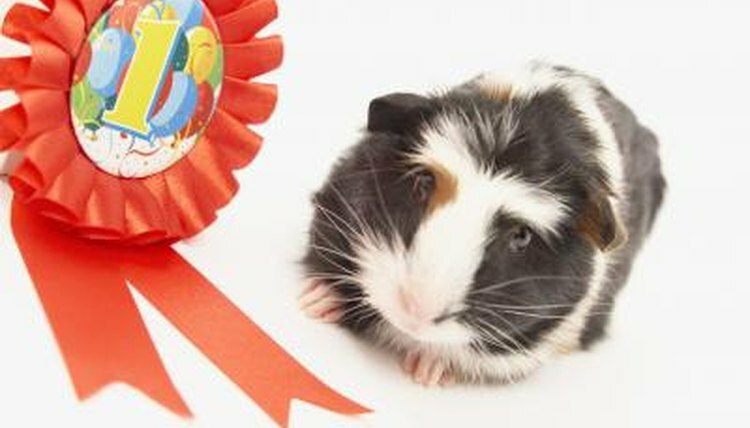 If you and your guinea pig participate in a cavy show club, your organization will usually provide grooming requirements and recommendations for shows. All the general bathing tips discussed below apply. In addition, you will probably need to trim nails, brush hair, and clean your cavy's grease gland. If you decide to bathe your guinea pig, you'll need a special small animal shampoo. Cavies have very sensitive skin. Washing can dry them out and cause painful itchiness and hot spots. Small animal shampoos, such as for rabbits, are formulated to be less drying than dog or human shampoos. Guinea pigs are prone to respiratory infections. In their small bodies, these can easily develop into pneumonia, so you must be very careful to keep your pig warm during wash time. You should use mildly warm -- not hot -- water, and thoroughly towel dry your pig after his bath. Some guinea pig experts recommend using a blow-drier on very low heat post-bath, but use extreme caution. Blow-driers can cause severe burns. It may be safer to perform all washing in a warm room, carefully towel-dry, and keep your pet close to you and your body until he's completely dry. Why Do Guinea Pigs Have Cowlicks?